The site lies along the eastern side of a dry valley on Hosey Common and consists of several tunnel entrances to the underground quarry workings. Surface workings are also known in the area. The mines consist of parallel tunnels up to 70m long, 1.8m high and about 3m wide. They provide excellent sections through the rag and hassock facies of the Lower Cretaceous Hythe Formation. 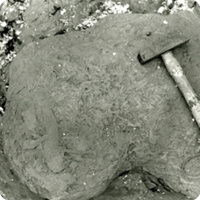 A sandstone variety of Ragstone, which is a limestone, was extracted as a building stone and the soft sandy hassock was left in the tunnels. The tunnels intersect gulls, which are fissures through the Ragstone. The gulls opened as stream excavated valleys and allowed the Ragstone to collapse towards the valley. Such gulls at other sites have produced valuable palaeontological data from their fills. No investigation of the fills has yet been undertaken at the Hosey Common mines. Westerham, with scheduled bus services, is a few minutes walk away and there is a car park on the B2026 at Hosey Common. Permission to visit the site must be obtained but is rarely given as it is an important bat hibernaculum. Permission will not be granted during the winter months from October to April. An Open Day is organised once a year, contact the Kent Wildlife Trust for details. Protective headgear is needed in the tunnels.